Seagate has lifted the lid on two new NAS drives aimed at small businesses and home office users. Both the new Seagate NAS and NAS Pro are available in 2- and 4-bay configurations and come with the latest version of Seagate's NAS operating system, NAS OS 4, which counts remote access, cloud backup, an app manager and RAID support among its features. The Seagate NAS, which features an ARM-based Marvell dual-core 1.2GHz processor and 512MB RAM, is designed to support small businesses and home offices with up to 25 users. It's available now starting £199 (around £341, or AU$364) for the 2-bay 2TB capacity model, which rises to £399 (around $638, or AU$730) for the 2-bay 8TB version. The 4-bay version range starts at £379 (around $649, or AU$694) for 4TB model, rising to £749 (around $1,282, or $1,372) for a chunky 16TB. The NAS Pro ups the internal horsepower by opting for an Intel dual-core 1.7GHz C2000 Series CPU backed up by 2GB RAM to chew through demanding tasks. It can support up to 50 home or office users and provides enough bandwidth to support fast and frequent file sharing between employees, according to Seagate, in addition to multiple applications running simultaneously. 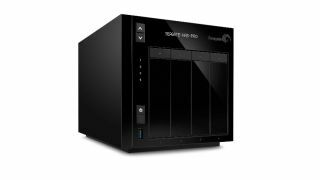 The NAS Pro range, which is already available now and includes 2-, 4- and 6-bay models, starts at £399 (around $683, or AU$731) for the 4TB model, which rises £1,839 (around $3,149, or $3,368) for 30TB. Looking for a cheap hard drive?